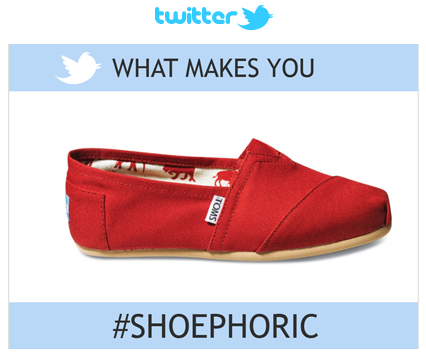 Tell us WHAT MAKES YOU SHOEPHORIC ? … and get a chance to win fabulous shoes from our 3 SIMULTANEOUS CONTESTS! All Contests starts Midnight EDT of September 12. You can join and win in more than one contest, so start getting SHOEPHORIC with US! Do you want to win TOMS? • 1 Tweet/Day = 1 Entry. 1 Entry/Day only. • Winner will be drawn Midnight EDT of September 26! Do you want to win SCHUTZ? • Comment on the “Shoephoric Photo of the Day”on What Makes You Shoephoric? • 1 Comment/Day = 1 Entry. 1 Entry/Day only. • Winner will be drawn Midnight EDT of October 5! The YVES SAINT LAURENT TRIB TOO PUMPS! 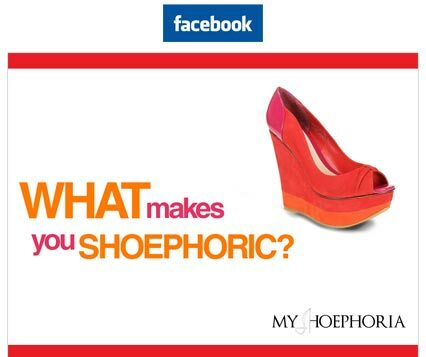 • Log in and Upload an original photo on “What Makes You Shoephoric?” to the Share Your Shoephoria page. • The Most LOVED photo by Midnight EDT of October 19 will win!